There are different table tennis glue that you can use for fixing or replacing your existing table tennis rubbers. The encouragement policy of ITTF on the use of inorganic glue has created quite a big impact in table tennis arena. Especially after the 2008 Olympic Games, inorganic glue completely ruled the regular competitions all over the world. Now, let me simply share with you on the use of inorganic glue. 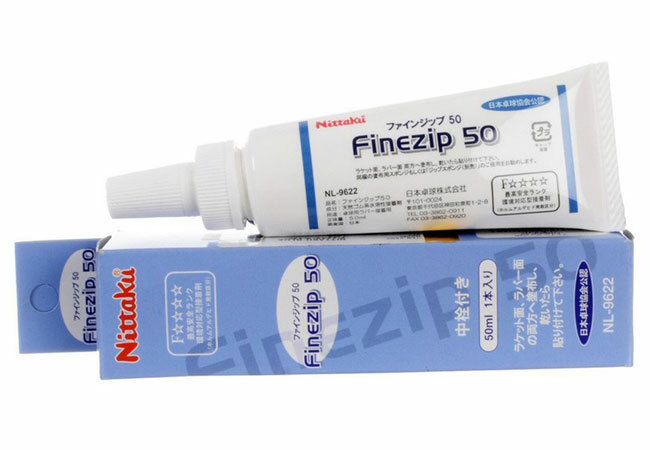 The first type is like the shape of toothpaste, the Japanese brand Nittaku Finezip 50 is of this type. The second type is with a thick liquid, Revolution 3 can be categorized in this type. The third type is diluted liquid. The glues from Butterfly belongs to this type. For the toothpaste type, the glue layer formed by the application of the glue is thicker. Therefore, it is difficult to apply to the rubber at once. The second type of glue is a little better than the toothpaste-like glue, but it is easy to have a bubble when applying it on the rubber. The third type of glue, such as the Butterfly Free Chack II, is very easy to generate particles on the blade and rubber. Therefore, it is not easy to be used by users. Nevertheless, I would still suggest amateur table tennis players to use the third type of glue. They can adjust the thickness of the glue layer by adjusting the number of times of application. When choosing table tennis glue, there are some criteria that you can treat as guidelines. First, choose the user-friendly packaging and those with smallmouth design that you can easily squeeze out the glue. Second, choose the glue that is easy to apply. The less thick glue is not easy to cause bubble surfacing on the rubber and blade. Third, choose the inorganic glue as it is easy to use. You can find it is easy for you to use the glue even you are using the glue for the first time. Forth, get a toughness glue that is relative to form a strong glue film. There is the water-based glue and the speed glue. The speed glue is illegal, and it is not accepted in the official tournament because of the hazardous nature of the substance used to produce it. So I strongly advise that you stay away from speed glue and use water-based glue for affixing your rubber to the table tennis blade. There are different table tennis glue out there, but here are some of the best glues for table tennis rackets I will recommend for you. This is a water-based glue that is approved by ITTF to be used to play in a tournament. The glue is voc-free which won’t cause any dizziness or headaches to a person. After applying the glue on your rubber and attach to your blade, you can expect the glue to be dry in between 5 minutes. One thing you need to remember is that you need to keep the glue in between 5°C to 40°C (40 to 104 degrees Fahrenheit.) This is to ensure the glue can be kept in good condition for a long time. You can get this Nittaku Finezip 50 from Amazon. Revolution 3 is a water-based glue with VOC-free performance. If you buy this glue, it will come with 2 long washable sponges that you can use when applying the glue. This glue can produce 3 viscosities (normal, medium, high). And the most popular one is the glue with normal viscosity. This is because normal viscosity is easier to apply and it makes the thickest layer of glue on the rubber and blade. But the viscosity is the least. You can get this glue from Megaspin. Free Chack II Glue is a new glue being released by Butterly. It is an enhanced version glue of Free Chack. They feature this newly formulated glue with latex-based adhesive. It has a stronger bond than Free Chack where it can hold a very strong bond within the blade and the rubber so it will not come off easily. The Free Chack II glue dry pretty quick on your blade after you apply it on your rubber and blade. Its viscosity is high with a very thin liquid. You can barely complain about this close to perfect glue. It allows easy removal of excess glue from sponge and blade surface. The glue is very runny which is easy to create a mess. So be careful when you are using this glue because it can get pretty messy if you spill some glue out. Also, you need to prevent the glue to get in contact with your clothing cause it will be very hard for you to get off. When you want to rip off the rubber from your blade, it can come off pretty easy. If you seal your blade before applying the glue, then it can also help in taking the rubber off easily. This Free Chack II is specially designed for Spring Sponge rubbers including the Tenergy series and SpinArt rubbers and it is available at Megaspin. Butterfly Free Chack is a very good table tennis glue. It is free from any toxins or VOC substance and made from natural rubber. It is easy to remove from the blade if you want to replace your rubber. 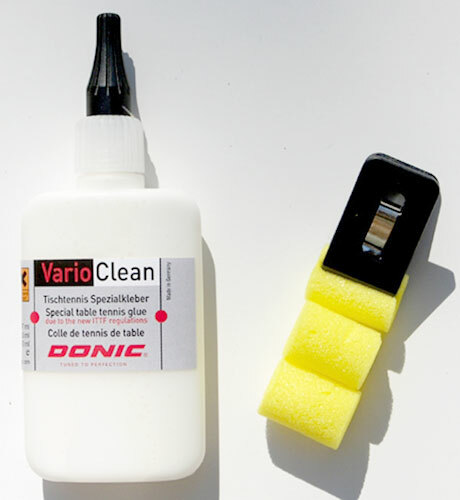 This glue is developed by Donic according to the new ITTF regulations. You can safely use this water-based glue to apply the glue on the rubber sheet without the need to worry if there is any health risk going to happen. When using it, you can apply the glue evenly on the rubber sheet and blade. Once it is done, you need to wait for 5 minutes to have the glue get dry and so the rubber can stick well on the blade. When you are not using, it is advisable for you to store the glue in a place with room temperature. This is a super glue for affixing your rubbers to your blade. It is an easy-to-use water-based table tennis glue. 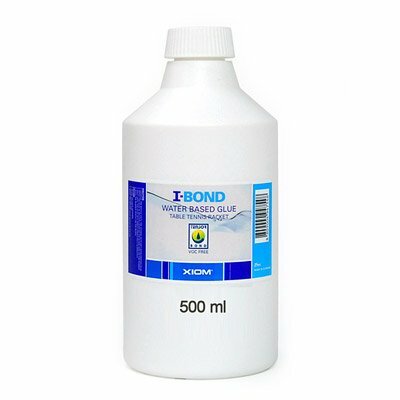 The XIOM I-Bond is clean and safe from any toxic or VOC substance. It has a white sponge at the tip of the bottle which is used to apply the glue. You have to understand that water-based glue is stronger than speed glue. It can damage the surface of your table tennis blade so it is highly recommended that you use The XIOM I-Bond sure on your blade before using the XIOM I-Bond table tennis glue. Using this glue, is it easy peel off the rubber and also the easiest to remove from the rubber and the blade? For easy removal, I would recommend Butterfly Free Chack II. I am using it myself and I found it allows easy removal of excess glue from sponge and blade surface.